This Friday, April 25, is ANZAC Day. Short for Australian and New Zealand Army Corp, it’s a day of remembrance for the 8,000 soldiers who died during the Battle of Gallipoli in World War I. Still young in their nationhood, Australia and New Zealand sent soldiers to join the Allied forces, who were landing on the Turkish peninsula in order to clear a sea route to supply the Russian army. Although the Allies had to retreat and although Gallipoli is remembered more for its mistakes than its accomplishments, the founding spirit of Australia and New Zealand rose from the image of the returning ANZAC soldiers: heroic, tough, irreverent and worthy of national pride freed from colonial superiority. 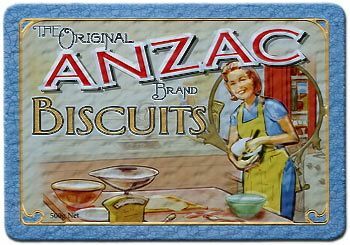 Still enjoyed in both countries is the ANZAC biscuit. Prepared by moms, aunts, sisters, fiancees and other bakers on the home front during tough rationing times, it’s a treat based on oats and sweetened with precious golden syrup. It’s one of my favorite cookies, with its crumbly texture and its not-too-sweet nuttiness. Fast forward now to Iraq and Afghanistan. Unless you have a direct connection to a soldier, care packages can no longer include homemade treats. A box of packaged sweets, clean socks, cooling wet-naps and good fiction is still very much appreciated, though. For the price of a movie and a burrito, you can put together a thank you package for someone fighting overseas and AnySoldier will help get it to a soldier in need. It’s hot there, so melty foods are not the best. Small pieces that can be easily shared are also more fun. I like to specify female soldiers and then include body powder, silly fun stuff like stickers that they can share with local kids and colorful gifts from the Japanese dollar store. While we may not have a proud cookie like the ANZAC biscuit for our current wars, I’d like to suggest making a batch of hadgi badah, an Iraqi cookie infused with cardamom, rose water and almonds. I’m not sure filling our mouths with sweetness is the appropriate response to the mess in the Middle East. But until we have an Operation Iraqi Freedom biscuit, a empathetic taste of hadgi badah is better than a bitter palate and an empty belly.